Project Kiwi : how one man’s passion for the land hatched New Zealand’s first community kiwi sanctuary/ Sue Hoffart. 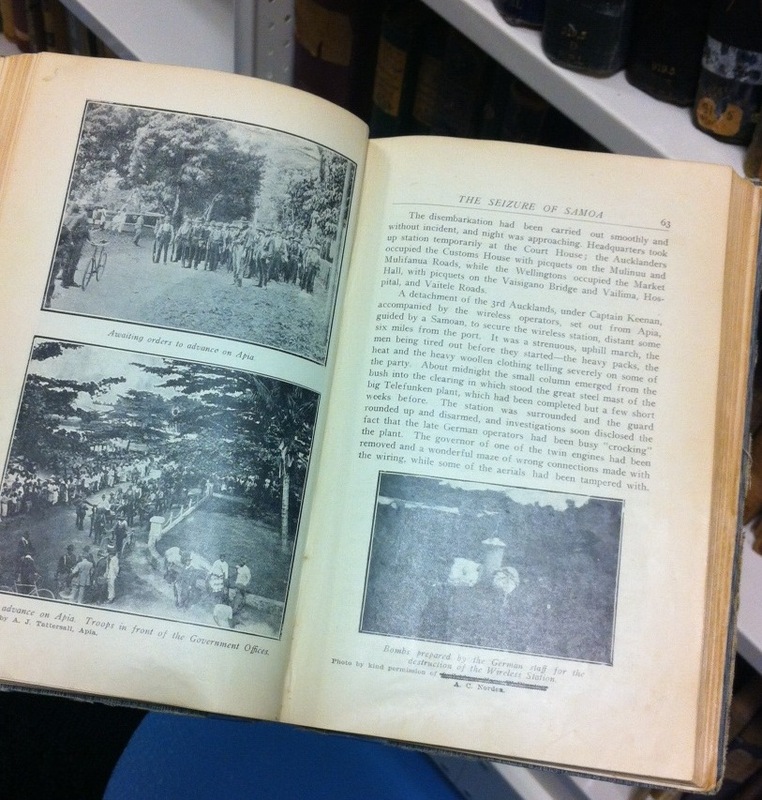 The road to hell : state violence against children in postwar New Zealand / Elizabeth Stanley. Dark days at the Oxygen Café / James Norcliffe. Nothing for it but to sing : poems / Michael Harlow. The black widow : how one woman got justice for her murdered brother / by Lee-Anne Cartier. Welcome to the latest Fiction Newsletter. This month we feature New Zealand writers in our ‘Other Genres’ category, as there are some talented new writers emerging. We have highlighted some wonderful novels from all our categories of recent picks, to ensure many hours of great reading during the long nights of mid-winter. Lynda.com – now free with your library card! Deciding on the novels to highlight in this month’s newsletter has been difficult due to the extraordinary number of brilliant writers recently received into the fiction collection. The following titles are just a taste of some great reading from the recent selection. Zero K : a novel / Don DeLillo. The Loney / Andrew Michael Hurley. The bricks that built the houses / Kate Tempest. Chosen for this newsletter are the only three stand-alone stories, from this month selection of new Graphic Novels, as the others were all the first volumes of new series. My degeneration : a journey through Parkinson’s / Peter Dunlap-Shohl. Beef with tomato / Dean Haspiel. This month’ new Mysteries includes the first novel by Chinese writer Song Ying, titled Apricot’s revenge: a crime novel, is set in China. It promises an ingenious plot, providing captivating reading, and is highly recommended. In the cold dark ground / Stuart MacBride. Apricot’s revenge : a crime novel / Song Ying ; translated from the Chinese by Howard Goldblatt and Sylvia Li-chun Lin. As readers of this genre expect they will be transported to new worlds, populated by a wide range of diverse characters, and placed in the most amazing situations. Each novel in this selection illustrates the brilliant imagination shown by each author. Barren Cove : a novel / Ariel S. Winter. The New Zealand writers featuring this month in our ‘Other Genre’ category reflect a wide range of theme. From historical to contemporary national issues, romance to time travel, all open some new and thought provoking views on our society. The blackbird sings at dusk / Linda Olsson. Something else / David Parkyn. The last time we spoke / Fiona Sussman. This month we are featuring New Zealand fiction in our ‘Other Genres’ category. In this selection there is an exciting, diverse, range on novels, and some great writing. New work from two much acclaimed veteran writers Owen Marshall and Damien Wilkins are also included. Hold my teeth while I teach you to dance / Mike Johnson. Return to Lucifer Creek/ Gary Joll. Cold hard murder / Trish McCormack. The death ray debacle / David McGill. Love as a stranger / Owen Marshall. Rachel’s legacy / Julie Thomas. Dad art / Damien Wilkins. New Zealand writers feature in this month’s selection from the new ‘Other Genres’ category. There are several debut novelists, and the fiction themes range from historical romances to psychological thrillers, from werewolves to substance abuse. Also included is the latest novel from the well-known writer Albert Wendt, titled Breaking connections. First names only : a New Zealand novel / Elaine Blick. New beginnings at Lilyfields / Lottie Bloom. The bordello girl / Hilary Murray. The seer’s wolf / Barbara Petrie. The exodus file / Reg Puckey. “An American scientist discovers an asteroid made of magnetite will pass close enough to Earth to shift not just the magnetic north pole but the physical north pole as well, right into the heart of the USA. Mark Lucas chooses to brief the President about America’s ice-age fate before telling his scientific colleagues, a decision that threatens to cost him his life, his conscience and his integrity, as a national security ‘cone of silence’ descends on his discovery. At what point does political power become megalomania? If the end of the world was coming, who would you tell?” (Adapted from Syndetics summary). The gentlemen’s club / Jen Shieff. Breaking connections : a novel / by Albert Wendt. The Pounamu prophecy : a sweeping story of love, betrayal and hope / Cindy Williams. How to grow an addict : a novel / J. A. Wright. Welcome to this month’s book and DVD selection featuring history, cooking and crafts, foreign literature, awarded films, and more! A good range of topics to offer you lots of ideas, instant inspiration and entertainment. Have fun! This month the New Zealand Collection takes a walk down memory lane reflecting on the New Zealand of childhoods. We also take a look into the Rugby World and the success of the All Blacks. Taking my mother to the opera / Diane Brown. A life on film / Geoff Murphy. Black obsession : the All Blacks’ quest for World Cup success / Gregor Paul. The antipodeans : a novel / Greg McGee. The highlights of new arrival DVDs include the long-awaited Woman in Gold and A Royal Night Out. Check out our new DVDs here and reserve the items you like. The salt of the earth : a journey with Sebastião Salgado. Explore some delightful additions to our Community Languages collection including history, romance and suspense. Enjoy! Rue des boutiques obscures / Patrick Modiano. Etoile errante / J.M.G. Le Clézio. Contigo en la distancia / Carla Guelfenbein. Platos exprés : 175 deliciosas recetas listas en 30 minutos o menos / Liz Franklin ; [traducción, Eva María Cantenys Félez]. Rubber band bracelets : 35 colorful projects you’ll love to make / Lucy Hopping. Neck effects : 30 scarves, wraps, and cowls to knit for now. 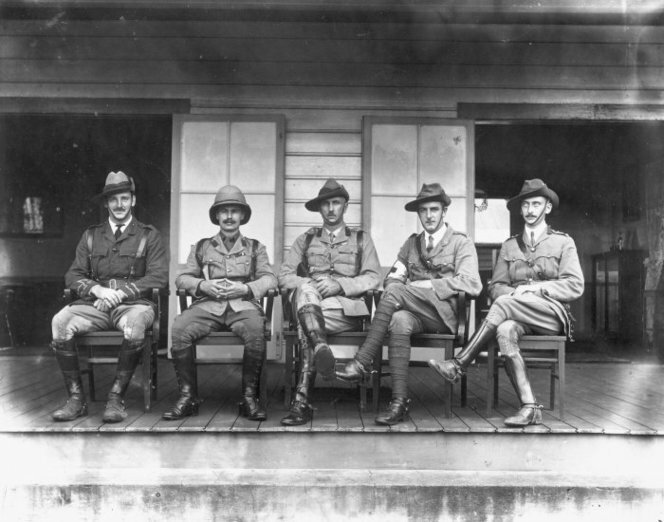 On 29 August 1914, New Zealand troops arrived in Samoa and seized it from German control. This turned out to be a reasonably simple expedition but at the time it was regarded as potentially risky, with unknown consequences. Samoa had been under German rule since 1900, but the presence of Germany in Samoa predates this. In 1855 Germany expanded its trading into the Pacific, initiating large-scale production of coconut, cacao and hevea rubber in Samoa (then known as the Navigator Islands). 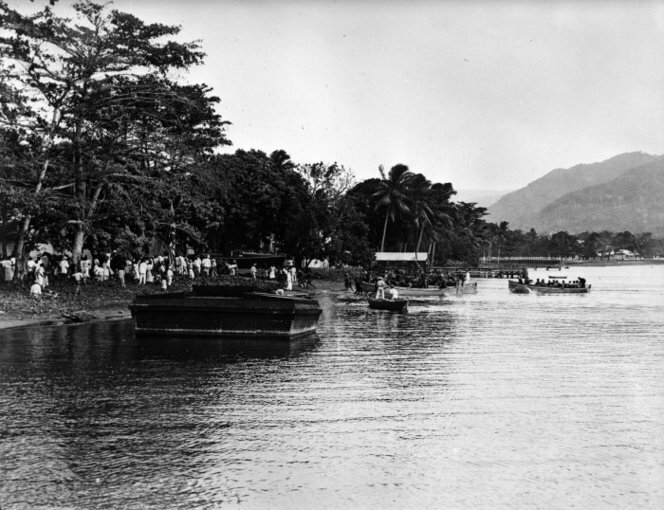 America and the United Kingdom also had business interests in the Pacific and opposed the German activity, which lead to the Second Samoan Civil War in 1899. Following this war, the Samoan islands were divided between the three opposing powers, with Germany being awarded what is today known as Western Samoa. It became regarded as the ‘jewel’ of German colonialism. 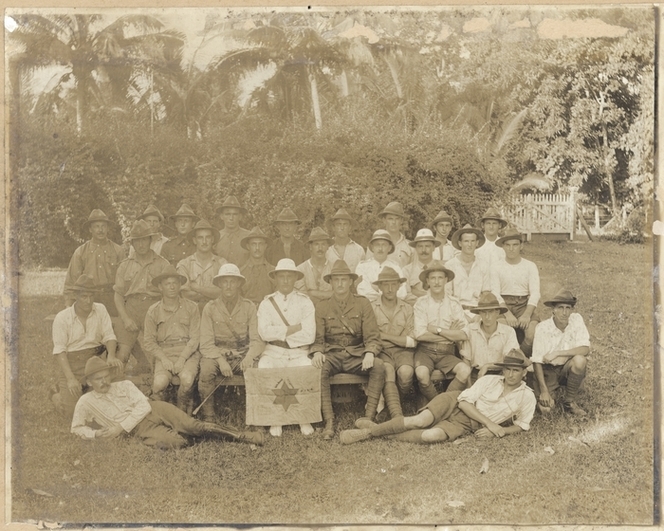 At the outbreak of war in 1914, Samoa was of moderate strategic importance to Germany. Using the radio transmitter located in the hills above Apia, German troops were able to send Morse code signals to Berlin, as well as communicate with the 90 warships in Germany’s naval fleet. Britain wanted this threat neutralised and New Zealand agreed to seize Samoa from Germany. 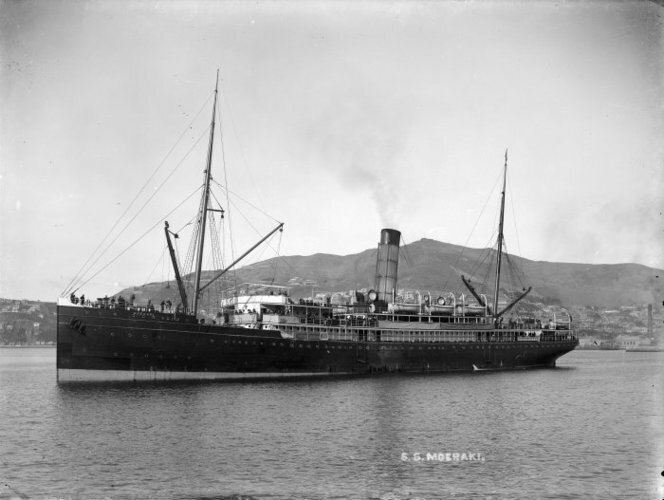 New Zealand troops departed from Wellington on the morning of Saturday 15 August in two ships, Monowai and Moeraki. These two ships had been requisitioned from the Union Steam Ship Company as transports, and were therefore slow and unarmed. These two unlikely war ships left the New Zealand convoy extremely vulnerable as they travelled to Samoa, especially as the location of the German East Asia Squadron was unknown to the Allies throughout their two week journey. When the New Zealand convoy reached French New Caledonia, they were joined by the Royal Australian Navy’s battlecruiser HMAS Australia, the light cruiser HMAS Melbourne and the French armoured cruiser Montcalm. While the landing at Gallipoli on 25 April 1915 is acknowledged as the birth of the Anzac legend, the first Australian–New Zealand military operation of the First World War was actually the capture of German Samoa in August 1914. Upon reaching Samoa, it became known to the New Zealand convoy that the German defences there were in fact quite weak; they had only 20 troops and special constables armed with 50 aging rifles. 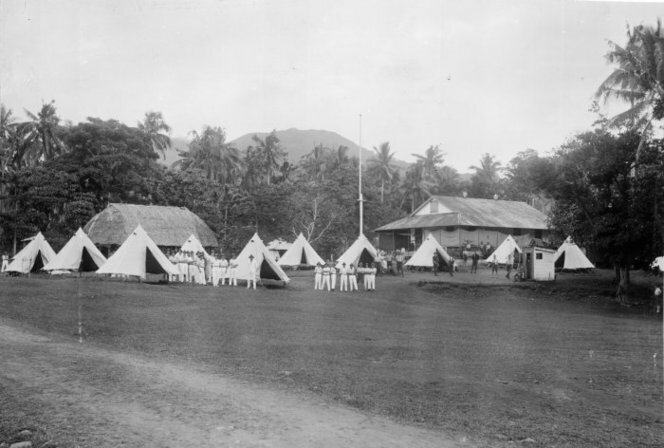 The Samoa Advance Party of the New Zealand Expeditionary Force landed at Apia on 29 August with no opposition. It was later discovered that the German administration had received orders from Berlin not to oppose an Allied invasion. A fortnight later, on 14 September, the Scharnhorst and Gneisenau arrived off Apia and the New Zealand garrison braced itself for large-calibre gunfire. Luckily, the cruisers left once their skippers realised that Samoa was no longer in German hands. Samoa was then declared to be under a New Zealand-run British military occupation. The British flag was raised outside the government building in Apia and Samoa became the second German territory, after Togoland in Africa, to fall to the Allies in the First World War. 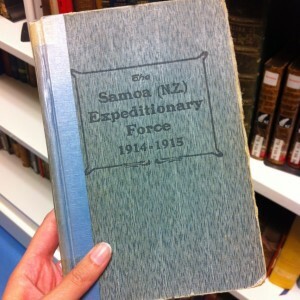 We have this book in our New Zealand Rare books collection. Published in 1924, it is in a fragile condition but may be viewed by request at the 2nd floor enquiries desk. This month the New Zealand Collection takes a walk down memory lane with two writers reflecting on the New Zealand of their childhoods. We also get a look into the lives of conservation stalwart Alan Mark and filmmaker Geoff Murphy. Design and art feature in books on vintage paua jewellery and the Wellington based WOW phenomenon. An historical whodunit set in Taranaki at a time of uneasy race relations in the 1880’s and a blog written by a dying father for his unborn daughter bring this New Zealand Collection recent arrivals almost to an end but in light of the upcoming weekend of Rugby world cup finals the last two picks are both All Black focused. The dreaming land / Martin Edmond. Vintage paua shell jewellery : art souvenir, tourist kitsch, Kiwi icon / Elly van de Wijdeven. World of WearableArt : 30 designers tell their stories / text by Naomi Arnold. The many deaths of Mary Dobie : murder, politics and revenge in nineteenth-century New Zealand / David Hastings. Message to my girl : a dying father’s powerful legacy of hope / Dr Jared Noel with David W. Williams. Legends in black : New Zealand rugby greats on why we win / Tom Johnson with Andy Martin, Geoff Watson and Margot Butcher. An amazing selection of new fiction from New Zealand writers, that reveals their skill and talent, over a wide range of different genres. We promise hours of entertaining and very satisfying reading. A crooked rib / Judy Corbalis. R.H.I. : two novellas / Tim Corballis. Trust no one : a thriller / Paul Cleave. The lost one : the Romanov legacy / by Penelope Haines. James Cook’s lost world / Graeme Lay. The battle of Messines Road / J.K. & W.J. Moloney. Road from Rosehall / Mike Munro. Paul Cleave has won this year’s Ngaio Marsh Award for his crime novel titled Five Minutes Alone. This is his eighth crime novel, the first was published in 2006 and was titled The Cleaner. This is the second time he has won this award, winning previously in 2011, with his novel titled Blood Men published in 2010. His novels have been translated into fifteen languages, and many have been shortlist for international crime writing awards.